Ongelungel was mystified — she’s a proud Palauan woman who grew up on the mainland but speaks Palauan fluently and spends time going back and forth. But she quickly realized that people who look like her are frequently not welcome in Hawaii. 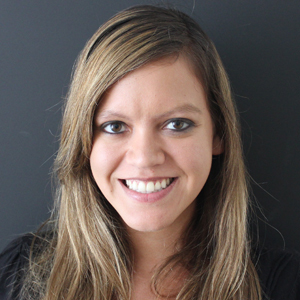 She left the islands after less than a year and when she returned in late 2016, she assumed there would be less racism. Sha Ongelungel is a Palauan activist and podcaster who identifies as queer and is frustrated with discrimination against Micronesians. “If anything it kind of felt like it had gotten worse,” she says. This is one example of many racist Facebook posts about Micronesians, who do, in fact, have families and social structures. Micronesia is a broad geographic region like Polynesia, both terms made up by a European explorer to describe neighboring swaths of the Pacific Ocean. Whereas Polynesia encompasses island chains like Hawaii, Tahiti, Samoa and Tonga, Micronesia is farther west and includes archipelagos like the Mariana Islands, the Marshall Islands, the Federated States of Micronesia and Palau. Even though the islands are made up of diverse languages and cultures, “Micronesians” has become a catch-all term in Hawaii for immigrants from Palau, the Marshall Islands and the Federated States of Micronesia who came here through treaties known as the Compacts of Free Association. The treaties give the U.S. valuable land and water for military training and bases while allowing people from those island nations to work and live freely in the U.S. Thousands of people have moved to the U.S. for better pay, education and health care services, which are extremely limited in the islands. The most famous Micronesian immigrant to Hawaii is Mau Piailug, who taught Native Hawaiian activists how to navigate using the stars and the waves in the 1970s. But members of his community have since been stigmatized as freeloaders and troublemakers, similar to stereotypes against undocumented immigrants on the mainland. The latest version of the Compacts say that the federal government will provide grant money to offset the cost of health care, education and other services for COFA immigrants. 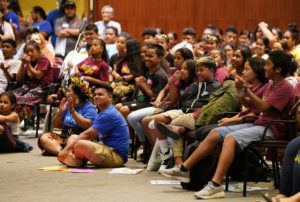 Hawaii received about $14.5 million in such grants this year, but estimates of the total cost of services have previously exceeded $100 million. 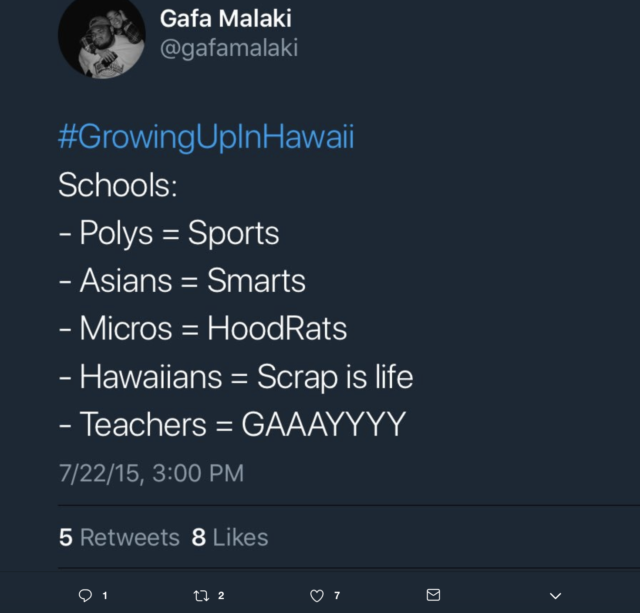 This tweet shares local negative stereotypes about Micronesians, who are far more impoverished than Polynesians, according to a recent state study that compared Marshallese people to Samoans, Tongans and Hawaiians. Due to their unique immigration status, Micronesians appear to be the only ethnic group about whom the state regularly calculates the financial burden on social services. The calculation doesn’t take into account the amount of money that Micronesians who work and pay taxes are contributing to the state. 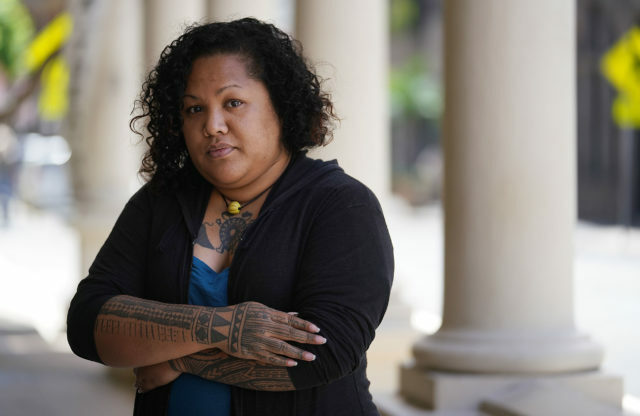 Ongelungel, who works two jobs along with other side hustles to make ends meet in Hawaii, says she’s frustrated by the perception that Micronesians are a burden to society when so many are smart and hardworking. Those who do get into trouble quickly get held up as an example of the entire community. 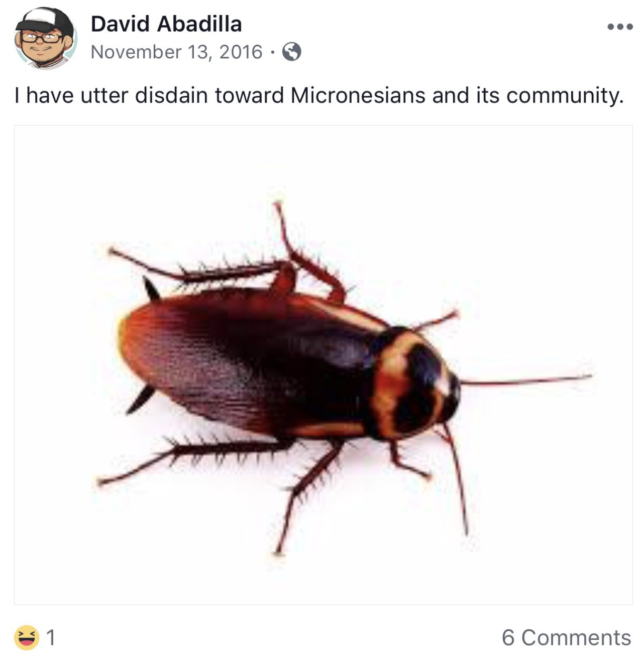 A Facebook post about a man who was harassing a driver and brandishing a knife prompted a slew of comments comparing Micronesians to cockroaches and animals. One even talked about “hunting” them and others suggested spraying Micronesians with Raid and pepper spray. Online comments encouraging violence against Micronesians are not unusual. This was in response to a video showing a man harassing a driver and brandishing a knife. 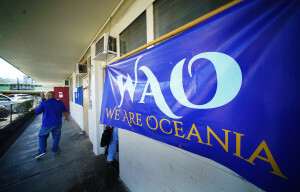 Some of the comments reflected the false notion that the government pays Micronesians who live in Hawaii. In fact, people who are citizens of COFA nations aren’t eligible for many public assistance programs, including food stamps and Medicaid. They pay the same taxes as other Hawaii residents but don’t have the same safety net available. Another Facebook post compares Micronesians to cockroaches. Disdain for Micronesians in Hawaii is so typical that during a jam session last year with local musicians Pati, Culture Crew and Anuhea, someone said “sshhh! !” prompting laughter during a lyric that was originally intended to celebrate the beauty of Micronesian women. The artists later apologized but Ongelungel said that the incident, which she saw on Facebook when she was in the hospital recovering from surgery, was particularly painful because it’s one of the few popular songs that actually acknowledges Micronesians. This post is making fun of traditional colorful dresses that Micronesian women often wear. Hawaii isn’t the only place where Micronesians feel unwelcome. 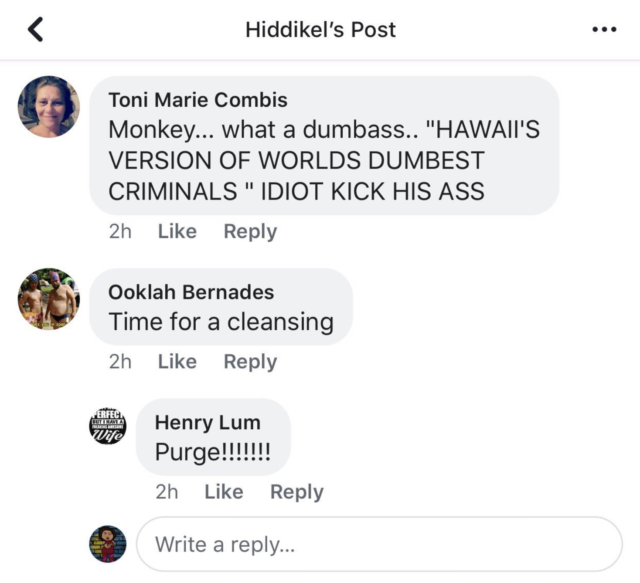 Ongelungel also posted a screenshot from a football player in Oregon and others from Guam where Chamorros — who are also Micronesian — talk about deporting Micronesians. She says it took her a long time to post every screenshot because she had to recover emotionally after reading each one. She hasn’t posted all of them yet because it’s too exhausting. “Oh that’s right, people want to kill us for some reason,” she thought, reading some of the Facebook comments. But she’s been pleased by how many people have expressed support and solidarity. She says some of her relatives told her not to post this thread because it would make her a target. But she wants people to know that it’s not okay.